Oak Hill is about as laid back as a place can be and still be called a town. I suspect the people who live and vacation there would prefer to keep it that way. 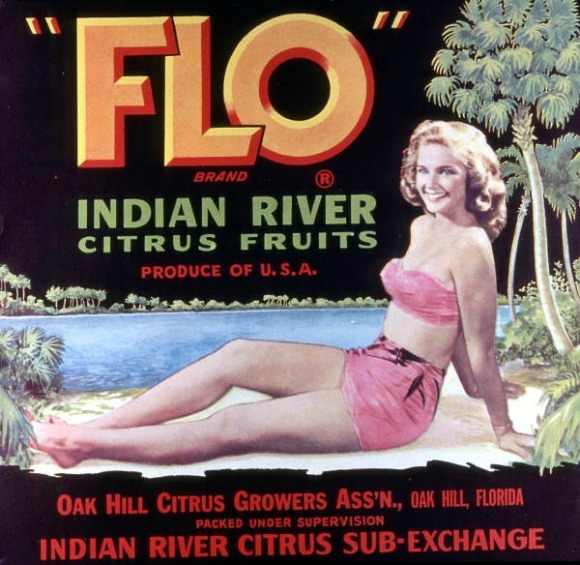 This town was once a thriving area growing and selling Indian River citrus and exporting its locally caught seafood all over the nation. Today it is a quiet zone between New Smyrna Beach on the north and Kennedy Space Center to the south. 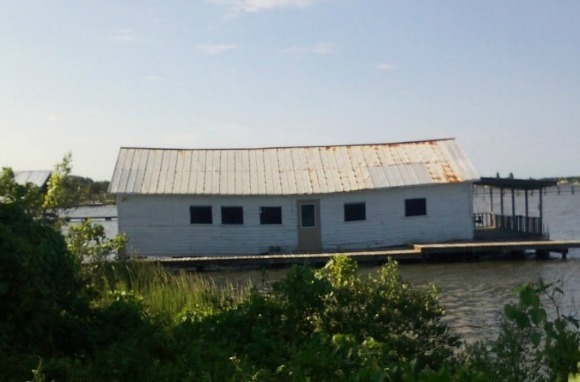 It nestles on a quiet spot between the barrier island and the mainland. The Indian River Lagoon narrows here before entering Mosquito Lagoon to the south. 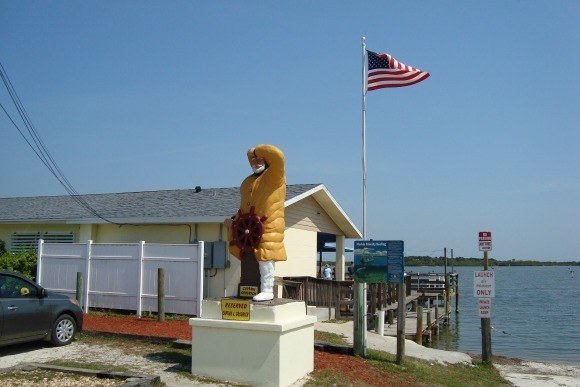 The town is directly west of the Atlantic barrier island and the Canaveral National Seashore. U.S. Highway One is the main route through town, but the areas you will want to see are mostly east of the highway and along the water. Fishing is still an important part of Oak Hill's economy, both commercial and sport. There are numerous guides operating out of the area that can take you to where the fish are. Some of the past grandeur of Oak Hill can be seen in a few old homes that are sprinkled among the quiet streets. Many of the open fields you see today were once magnificent citrus groves that have disappeared over the years. Some are gone because of the bad freezes now and then; others succumbed to the changing global economy. Some still remain, but far fewer than when Oak Hill was in its heyday in the first half of the twentieth century. Oak Hill has become a favorite wintering spot for people that like to fish and spend time in their recreational vehicles. 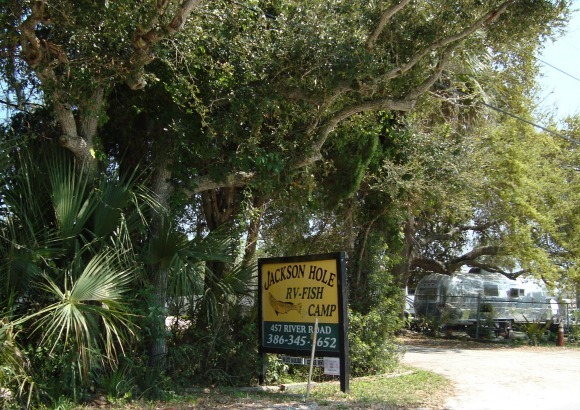 There are several fish camps and RV parks in town; most of them are pretty full in the winter months. Nights are very quiet in this little town and people like it that way. 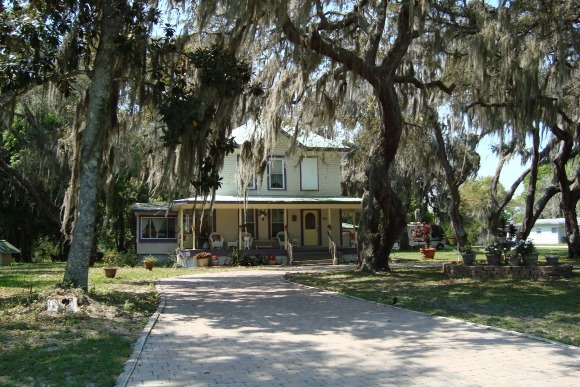 An interesting place to visit is Seminole Rest. It is part of the Canaveral National Seashore even though it is on the mainland side of the lagoon. The early Native Americans in Florida loved the waters around Oak Hill for their abundant harvests of oysters. 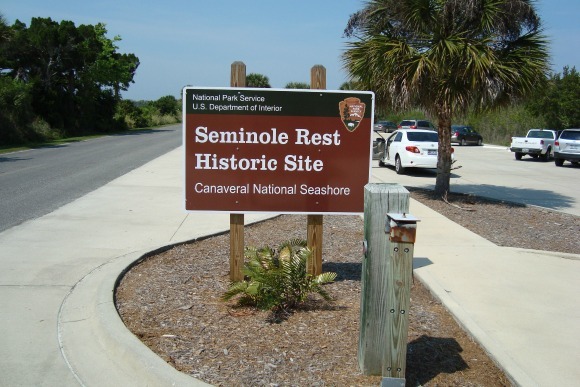 Seminole Rest has several prehistoric shell mounds that are unique because of their scarcity in Florida. Most of these mounds were destroyed in pioneer days and used as road building materials. The site has trails, parking and rest rooms. Goodrich's has been around since 1971. I remember it being a far more rustic place in those early days than the modern place it has become. I recently visited on a Wednesday and purposely didn't show up until 100pm, hoping to avoid the lunch crowd. It didn't work: the place was jammed. Having said that, however, the service was still cheerful and fairly prompt considering the large number of people being fed. It was a sunny day and about half of the patrons were sitting outside on the deck. I chose to stay in the shade and dine in the cozy interior. The menu is a delight to read; it makes you hungry just to see some of the items on the menu. I love mullet and wanted to have it as an appetizer. Darn it! They were out of mullet. The waitress told me they usually have it but for some reason they were out right now. There were plenty of other things on the menu, so I didn't whine. 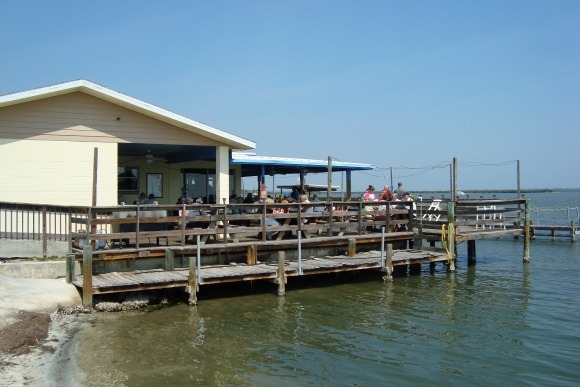 Entrees include a lot of fried seafood baskets, crab cakes, clam strips, swai, shrimp, catches of the day and oysters, lots of oysters. I don't like oysters but would like to attend one of their oyster roasts anyway. That's how they got to be famous locally. They have oyster roast parties on the deck for groups of twenty or more. I ordered fish chowder and blackened grilled shrimp. While the food was being prepared I enjoyed watching numerous kayaks in the waters of the Halifax River. Several large sailboats and trawlers cruised by on their slow way north from winters in the southern regions. The chowder wasn't bad, but it had too many potatoes and not enough fish. The grilled shrimp, on the other hand, were delicious. A dozen of them was just right!. The hush puppies were among the best I've ever had. The cole slaw was crunchy and delicious. I was on a diet on this visit, so I didn't have any fried stuff other than a couple of hush puppies. I talked to other customers who said the fried fish, shrimp and oysters are great. Lightly battered and not greasy. Maybe next time I'll be down to my fighting weight and can try some fried goodies. 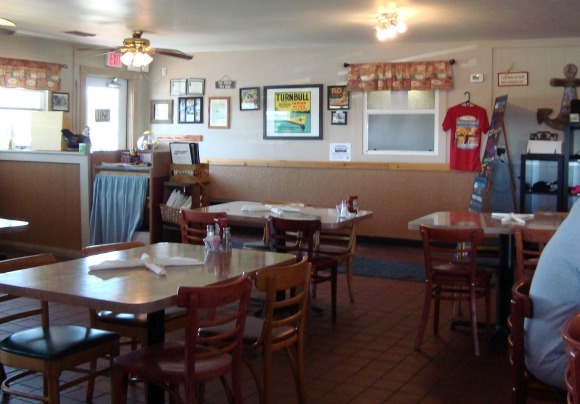 Goodrich's is also famous locally for their great breakfasts and packs them in from the local fish camps and RV parks. Beer and wine is served here, but since it was lunch and I'm on a diet, I didn't try any. There is a rumor that Goodrich's property and building is owned by former Miami Dolphin Hall of Famer Larry Czonka. I didn't see him, but a check of the Volusia County property records (2015) shows that he does indeed own it. Good job, Larry! Goodrich's is open Tuesday-Saturday from 7am to 9pm, and Sunday from 7am to 5pm. Closed on Mondays.